Thursday, February 27th, 2014 | 1:18 pm	and filed in Synthesizers, Samples. For those who follow my social media streams, you may have already seen the various DIYAudio, DIYSynth, DIYrepair projects going on around here for the past year. 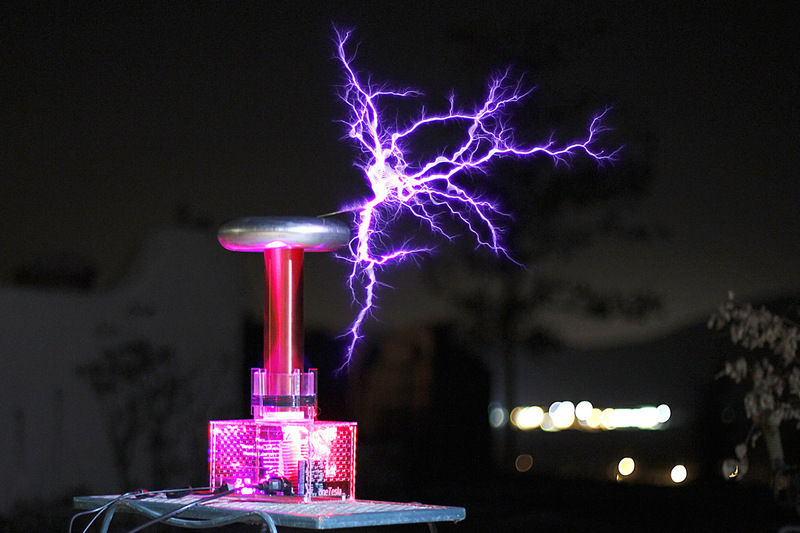 One of these projects is the oneTesla Musical Tesla Coil kit. In “synth speak” it’s essentially a pulse wave oscillator. The oneTesla incorporates an arduino brain that receives MIDI note information, and the sparking plasma threads emitting from the coil oscillate at musical pitches. I certainly recommend the kit if you’re looking for a fun weekend project, however it may require some debugging and may also require the need for a function generator and oscilloscope. Over the past year it seems that the development team has ironed out the kinks in the design and even novices generally have great success in their builds. The link below is an archive of the multisampled notes generated from the oneTesla. I’ve provided the archive as a folder containing an NN-XT patch. The audio was recorded at quite a distance from the Tesla coil, mainly because I didn’t want the coil to discharge through the microphone, but also because the output is incredibly loud. The recorded results aren’t as impressive as having the real-time audio-visual experience, so get a better “feel” of the actual sound, it’s recommended that you run the sampler output into a peak limiter and push the gain up 3dB to 9dB, and play the samples back at very high levels. The coil is sampled note-by-note from MIDI C0 to C5, and you will hear “spark” artifacts and a few obvious loop edits. « Alias8 CV Modular Patch Challenge!